Two of the major selling points for The Legend of Zelda: Spirits Tracks have been the train and the addition of Zelda to Link as a companion character. But what can you expect from the rest of the game? I sat down at Nintendo's Redwood City office to get a good look at the single-player mode for myself (since all I had to go on were Nintendo Power previews and Stephen Totlio's experience) before diving into the multiplayer mode. I was given a choice: I could replay the same demo Nintendo Power and Totilo had already covered, or I could be one of the first to see the second dungeon in the game – the Snow Temple. What kind of correspondent would I be if I didn't go for the latter? A copycat, that's what! The Snow Temple was described to me as the "second" dungeon in the game once Zelda and Link are sent to the Tower of Spirits to restore the Spirit Tracks of Hyrule. The level began outside the snow-covered structure with the train parked out front and Zelda hovering beside Link. The temple had about three floors and judging from the main room that requires puzzle solving, I'd say I completed three quarters of it before having to stop to play some multiplayer. The game comes out December 7. I was playing on a normal-sized cartridge that could well be a final version of the game. My Snow Temple For An Item-Toggling Button: Link started this dungeon with the Whirlwind item and earned the Boomerang about halfway through. To use an item, you've got to select it from a menu so that it appears in an icon in the upper right hand side of the lower screen. Tapping that icon activates the item and then you do whatever is required of you to use it (blow in the mic for the Whirlwind, draw a path on the screen for the Boomerang). There came a point in this dungeon where you had to use the boomerang to create a path of ice over water (by crossing its path through an ice torch and back across the water) – and then quickly change to the Whirlwind to activate a switch out in the middle of the water. Because the ice path melts quickly, your timing has to be spot on and it can get pretty fiddly when you're trying to bust out the Whirlwind, aim it and THEN blow into the mic. I died at least twice, wishing in vain that a tap of the shoulder button would switch between items. Dude, Where's My Zelda? As soon as I set foot in the Snow Temple, Zelda shrank and faded away with a sigh. It turns out she can't go with you or help you within the Temples and you can't talk to her for advice the way you could with other companion characters in other Zelda games. This turned Spirit Tracks into an experience that was an awful lot like Phantom Hourglass. Phantom Hourglass was good, so that's not an automatic minus – but I think people were expecting the all-new Zelda gameplay to be a consistent feature instead of an area-specific thing. 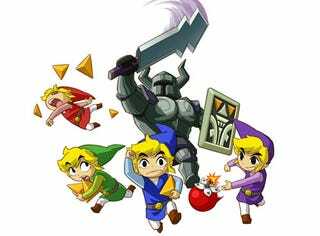 Shallow Learning Curve: Truthfully, I never beat The Legend of Zelda: Phantom Hourglass and it's been ages since I've touched it. But it really didn't take long to master the stylus-only controls and the menus weren't at all difficult to navigate and interpret. People who missed out on Phantom Hourglass are going to be just fine adjusting to Spirit Tracks. Sure Rings My Bell: The entire temple was based on moving three bells into a main room together so that Link could trigger them in a sequence to open a door. This objective was communicated entirely through visuals (little panels with bells on different note lines, panels on the floor, etc.) and all of the puzzles were familiar slide-the-block, clear-the-room-of-monsters affairs that I know and love in Zelda games. I got so caught up in the familiar, simple gameplay, I didn't mind dying twice and getting stuck three different times. Despite not having beaten Phantom Hourglass and not really liking The Legend of Zelda: Wind Waker (yeah, I said it – you wanna fight?! ), playing Spirit Tracks felt like coming home. That's probably the best feeling I could ask for from a game, especially so close to the holidays when I long for that feeling and have all this extra time to play games.